Do you have Bollinger Bands on your chart? Most traders have heard of the immensely popular Bollinger Bands, but may not know the background of the successful chart indicator. Bollinger Bands (BB) constitute a part of Technical Analysis, but in fact, Bollinger himself always focused on the overlap between the technical and fundamental analysis rather than on the differences between the two. Today's article explains the success story of Bollinger Bands and Bollinger's contributions to the field of Technical Analysis. Also, be sure to check out Sunday's article, which discusses an excellent Bollinger Band strategy. John Bollinger (born 1950) contributed significantly to the field of Technical Analysis, primarily owing to his invention of Bollinger Bands (BB) back in the 1980s. His multiple books, TV appearances, investments, multiple board memberships with Technical Associations, and a research firm make him a top influencer in the field. His efforts have been recognised with multiple awards, including the Lifetime Achievement Award from the International Federation of Technical Analysts in 2015. It emphasises the benefit of using all types of analysis to engage and analyse the market rather than sticking to one method only. It prefers to use the tool that has most relevance at the time (varies in time), but often relies on a combination of three or four for optimal results. What do Bollinger Bands indicate? 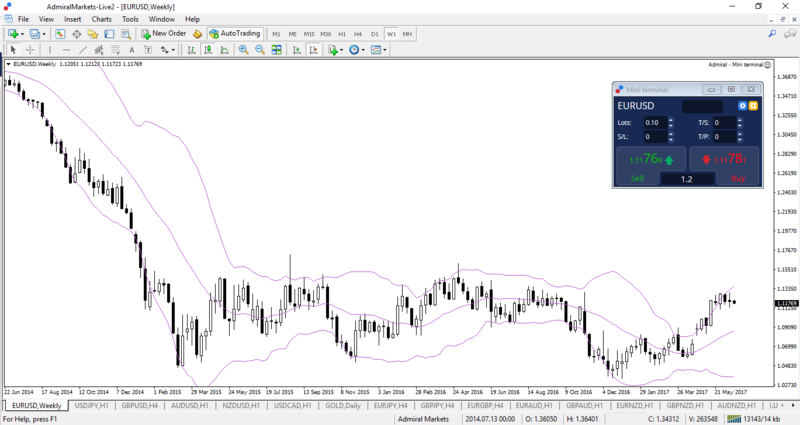 Bollinger Bands (BB) are a technical indicator that can be applied and used in all financial markets including Forex, CFD, and commodities. The indicator plots two bands around a short-term moving average (MA) of the price movement (middle of the band). Upper band = SMA + ATR (ATR is usually multiplied by specific factor). Lower band = SMA - ATR (ATR is usually multiplied by specific factor). The BB will expand and contract when the price increases its volatility. The BB will tighten when the price decreases its volatility (the "Squeeze"). Basically, the volatility increases when the distance between the upper and lower band widens and decreases when the distance narrows (purple boxes in the image below). The main benefit of applying BB is the ability to spot support and resistance (S&R) and recognise patterns at Bollinger Band S&R levels. 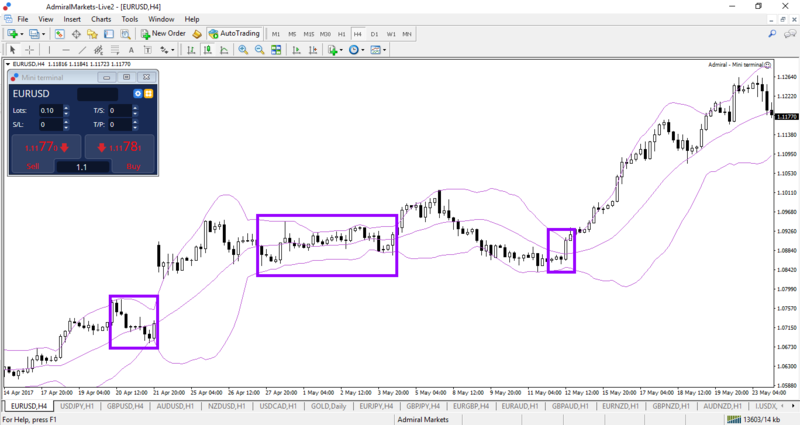 What are the benefits of using Bollinger Bands? Traders should use Bollinger Bands (BB) only as a tool of confluence along with other indicators, price action, and candlestick patterns... NOT as a signal generator. Traders do use Bollinger Bands in different shapes and forms, but the BB indicator is not intended as a source of non-stop advice. In fact, it is to help traders locate the key "points of confluence", or POC in short. Price to hit the bottom band within an uptrend. Or price to hit the top band within a downtrend. Bottom band: Reversal back up or breakout below band. In my live trading room at Admiral Markets, I often use a band type indicator for the exact same three reasons mentioned above, although I add the Keltner Indicator from the MT4 Supreme Edition to my charts. What are key tips for BB? A candle close outside of the Bollinger Band initially indicates the potential for a breakout and continuation and does not constitute a reversal signal. A reversal candlestick pattern at the bands could indicate failure to breakout and a potential reversal. Bollinger Bands offer extra value and information on all time frames irrespective whether it is a 5-minute or a weekly graph. Bollinger Bands can be used to spot chart patterns, such as double top, double bottom, or shift in momentum. The default parameter for the moving average is 20. The standard deviation needs to be adjusted if the moving average is changed: two standard deviations at 20 periods, 2.1 at 50 periods, and 1.9 at 10 periods. Feel free to view the video below for more information on Bollinger Bands and other similar indicators. 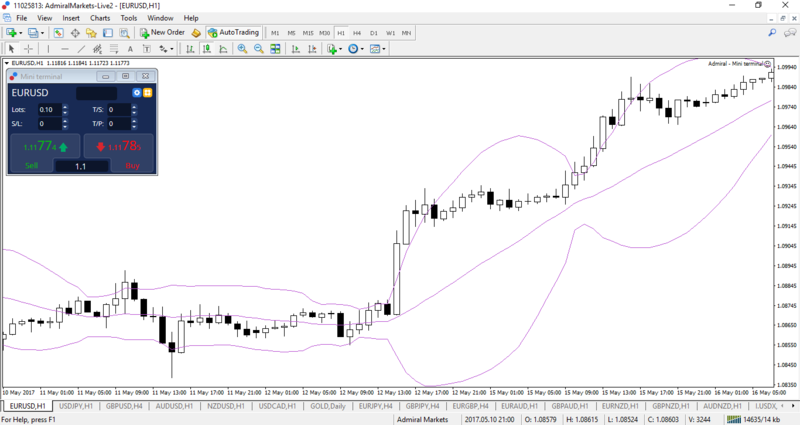 Also, check out our next blog article on applying Bollinger Bands in a strategy.